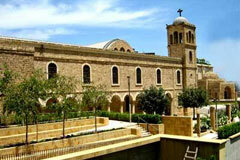 The Saint Elias Cathedral is affiliated with the Greek Melkite Catholic Church in Lebanon dating from the 19th century, the cathedral is characterized by its Byzantine architecture and beautiful oriental decoration. The cathedral is famous for its notable neo-classical interior design, its marble iconostasis, the Gothic arcs, and the celestial oculi. The cathedral was restored by the Archdiocese in 1994, after the damages caused by the war. The restoration works began at the end of 2003 and ended in May 2006.